tl;dr: Plenty of late-stage financing will be available for cleantech start-ups over the next few years, but seed/Series A money is another matter. 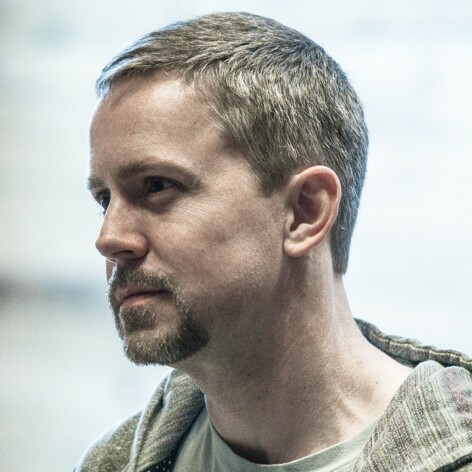 There’s been a pile of negative news about cleantech start-ups recently. I’ve heard it said more than once in the past month that venture-backed entrepreneurship clearly isn’t working here, so maybe we should all pack our bags and go home. Given the human bias to extrapolate individual events into overarching trends, I figured now would be a good time to review the data so far about cleantech VC performance – and I stress data, not anecdote or assertion! – to see what we can learn. This is a meaty topic, so I’m going to cover it in four posts. Today I’m going to focus on the money – how much capital has been available for cleantech start-ups so far, and what we can expect in the next few years. Two subsequent posts will address the VC investors that are supplying this cash, as well as the experiences of start-up companies that have achieved liftoff. In the final post, I’ll wrap it all up with some parting thoughts. 1995 to 1999: Baseline. This period shows us what cleantech start-up financing looks like when there’s no external forcing function to influence it. The answer is $200 million +/- $100 million per year in 30-50 transactions annually. During this period the venture capital industry as a whole grew dramatically – from about $7 billion invested per year to more than $50 billion – so cleantech accounted for a shrinking percentage of the total. 2000 to 2005: Bubble fumbling. The year 2000 saw the peak of the Internet bubble and a commensurate peak in total venture capital investment: An all-time record of nearly $100 billion went into start-up companies that year, mostly of the Internet variety. But the bubble promptly burst, and VC firms that had just raised billions of fresh dollars had to find something other than dot-com start-ups to invest them in. I’d characterize what happened in the years that followed as “fumbling around for another bubble,” marked by broad interest in the physical sciences instead of cleantech per se (you may recall this as the time when nanotechnology became an investment meme). 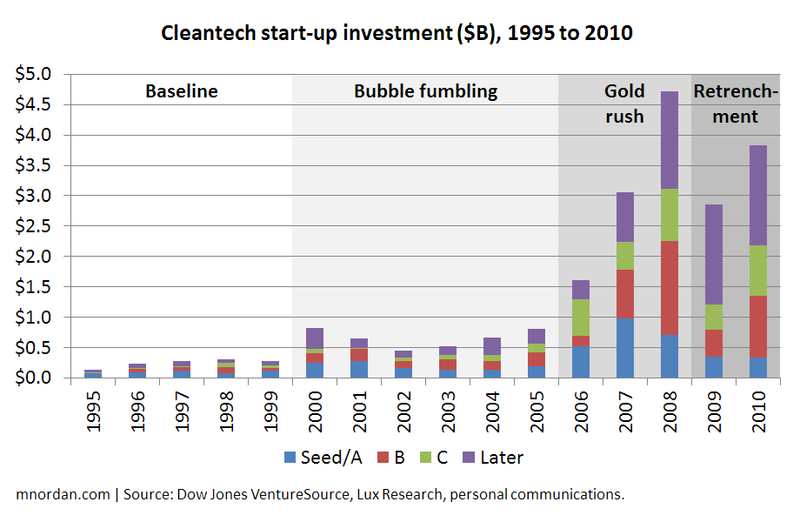 Cleantech benefited considerably from the fumbling, however, and in 2005 start-up investment in the field broke $800 million – several times greater than in the late ‘90s. 2006 to 2008: Gold rush. 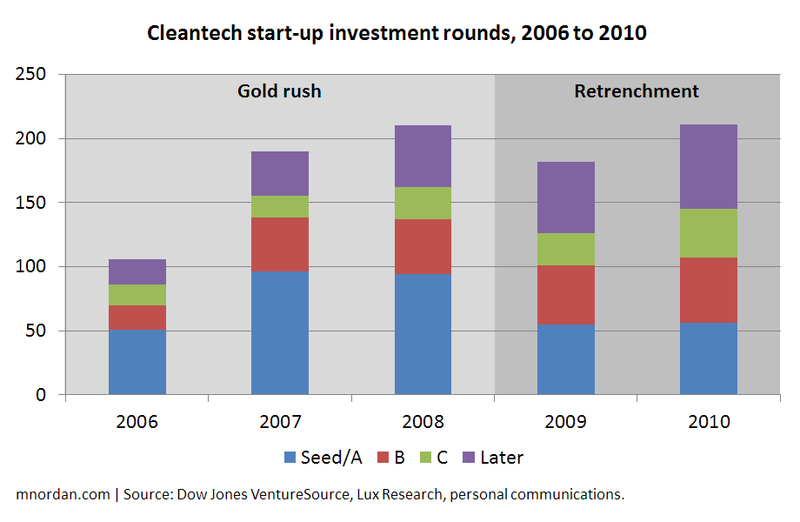 Starting in 2006, cleantech became a major VC focus area, and start-up financing rose by 50%+ annually for three years. You might think this happened because all the venture capitalists went to see “An Inconvenient Truth” on the same night, but I think a different sort of herd mentality was at work: In Q4 2005, three solar companies went public, all at valuations around $1 billion – namely Q-Cells, SunPower, and Suntech – and hundreds of VC firms hopped on the bandwagon. (You may mock the VC asset class for collectively deciding that cleantech was the next big thing, but you may also respect it for recognizing the intersection of favorable secular trends with a quarter-century of neglected tech innovation!) 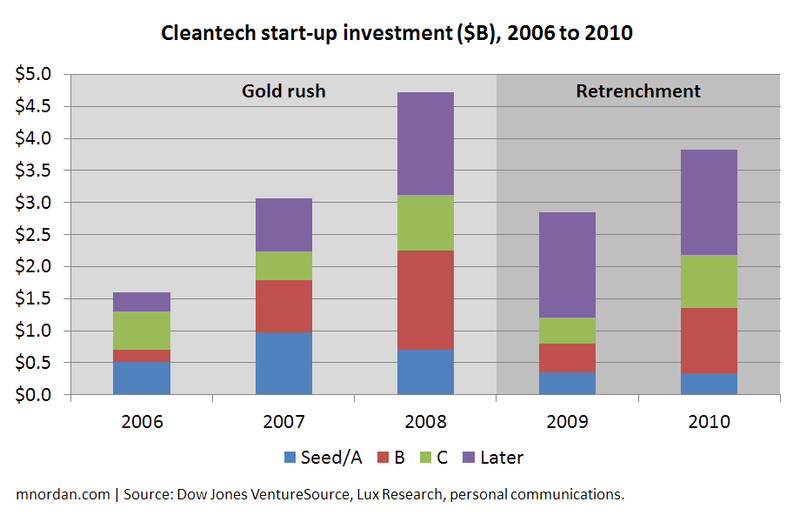 As a result, cleantech start-up financing skyrocketed to exceed $4.5 billion in 2008. Note that toward the end of this period, after initial bets were placed, money began to shift away from brand-new companies: Seed/Series A financing fell by 29% from 2007 to 2008. 2009 to now: Retrenchment. In September 2008, Lehman Brothers filed for bankruptcy and the stock market went into free-fall, losing 30% of its value by year-end. This spooked investors of all types, venture capitalists included, and cleantech start-up investment dropped by a third in 2009. For entrepreneurs launching new businesses, the more significant development was that Seed/Series A funding fell by half, returning to 2006 levels. 2010 brought a substantial recovery, but not a new peak, while Seed/Series A funding for new start-ups stagnated. As for 2011, the year’s not over yet, but based on current figures this year will be flat or down overall with a level of Seed/Series A investment comparable to 2010.
Financing rose sharply to a peak in 2008 and bounced around after that. Late-stage financing has ballooned as more companies have “graduated” to big Series D and later rounds, where they need lots of cash to build factories, hire sales forces, establish distribution channels, etc. Seed/Series A financing for brand-new businesses has fallen substantially. This evens out the visual a bit because the late-stage investments aren’t weighted up by their disproportionate value. However, they still predominate: Sixty-six Series D and later rounds were raised last year, more than other stage. In contrast, the number of early-stage investment rounds has plummeted. Nearly 100 new cleantech companies per year received seed/Series A funding in 2007 and 2008, but only 50 or so did in 2009 and 2010. All of this rear-facing stuff is fine and good, but if I’m an entrepreneur, I want to know what’s going to happen in the future. If my cleantech business will require lots of late-stage capital down the road, what is the competition for that money going to look like? You can see the big takeaway here: There will be a path-breaking requirement for late-stage financing in 2012-2014 as the “baby boom” of companies formed in the last five years plays out. In 2008-2010, an average of $1.8 billion per year went into Series D and later rounds – but during 2012-2014, an average of $3.3 billion per year will be needed. That’s an extra $1.5 billion in late-stage financing annually, or $4.5 billion across the three years. So will this money be available? Or will otherwise-auspicious cleantech start-ups go begging? VantagePoint is reportedly in the market for a $1.25 billion cleantech growth fund. Silver Lake Kraftwerk, a new vehicle also raising money now, is said to have a $1 billion target. BlackRock and NTR announced a new late-stage cleantech fund back in February. I’m not sure where this one stands, but if it goes forward, a fund smaller than $1 billion would be out of character. Khosla’s new $1 billion fund is half-allocated to cleantech, and I’d bet most of that portion is aimed at late-stage investment – perhaps $300 million? Hudson Clean Energy’s $1 billion first fund, raised in 2009 and focused exclusively on late-stage investments, should still have some fresh capital – and in the meantime the firm appears to be raising a second one worth $1.5 billion. The entities above would get you near $4.5 billion all by themselves, and the shift to later-stage allocations among all the other VC investors should be sufficient to cover any shortfall. So I think we can conclude that there will indeed be adequate late-stage financing for cleantech start-ups in the next few years – and happily so, since the need will be unprecedented. My concern, as you might expect, is that there may be insufficient Seed/Series A capital available to fund new cleantech enterprises. The limited partners who supply VC firms with money to invest are putting less and less capital into VC overall, and the share of that money that will be allocated to cleantech is unlikely to grow in the near term. If shrinking cleantech allocations get disproportionately earmarked toward late-stage investment, Seed/Series A capital will be thin on the ground. I’m self-interested in this because our team at Venrock invests early, we prefer to do so in conjunction with peers, and we already have fewer co-investors available to us now than we did two years ago. This brings us to a different question: What would have to happen for LPs to pump more money into cleantech rather than the same or less? That depends on returns, which I’ll address in the next post. 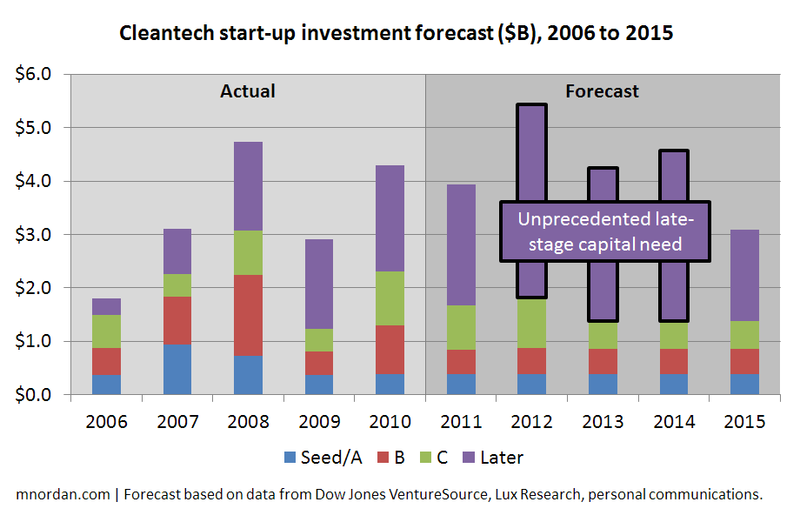 This entry was posted in Numbers, The State of Cleantech VC 2011, Venture capital. Bookmark the permalink. – Are the figures on multiples based on empirical data? Hi Richard — I had the same initial reaction on the C-round graduation rate, but that’s what the numbers say, as those assumptions are indeed back-calculated from empirical data. 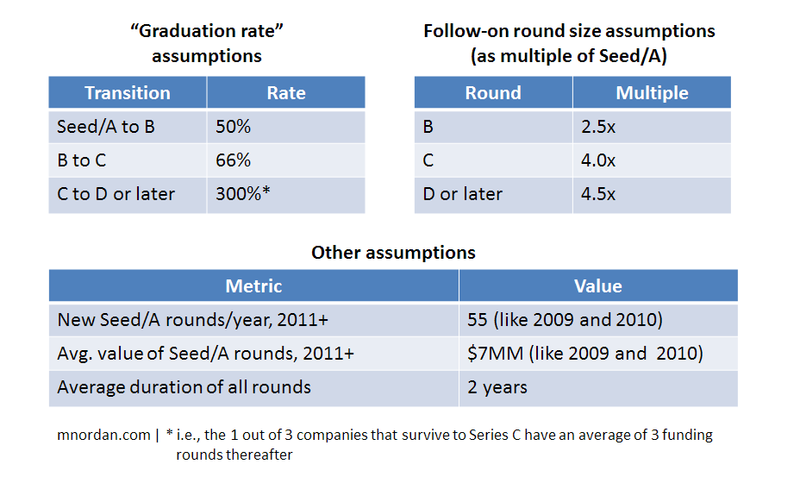 One presumes the truth is that not all C-round companies go forward but those that do raise more than three rounds. Someone with a lot of patience could go through company-by-company and determine this. I’m also wondering if some of the unusual current characteristics of the cleantech market could have a distorting effect on the ratios. For example, could it be argued that certain sectors (solar, wind) have reached a scalability tipping point and companies in the respective spaces require – and justify – vastly larger amounts of capital in later rounds? Another potential factor that may differentiate it from other spaces is the capital intensity required to displace existing infrastructure. A lot of project finance there, but perhaps secondary effects. Thanks.